Add interest to your clothes and accessories with some gorgeous applique. 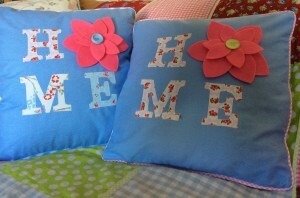 You can personalise your clothes & cushions with names, motifs or simple applique flowers. We have a range of creative shapes available using the 'Sizzix Big Shot' to cut and make perfect petals, hearts, butterflies or you can create your own by copying your design onto Bondaweb. Knowledge level: Applique can be machine or handsewn so is suitable for all. Additional costs: None. Everything is included in the price. You will only be creating samples but if you wish to bring something along to applique please do (it must be a flat single layer).